•This tool will delete the associated RivEX_Workspace folder and settings file for the currently selected Workspace. You might want to do this if a change has occurred in RivEX that makes the settings file incompatible with the latest release or you have done much editing outside RivEX. It would be simpler and less error prone to completely remove the Workspace and start again. This is the recommended approach. Deletion is permanent, there is no undo for this action! •When you run this tool you will be presented with the following message box, you can bail out at this point in case you ran the tool by mistake. 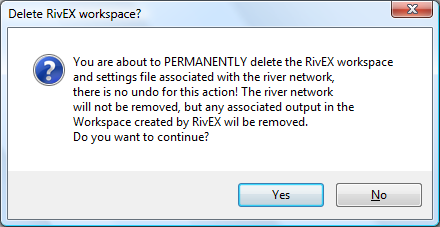 •Click YES and the following will occur: the river network is removed from the map, RivEX attempts to delete the RivEX_Workspace folder and if successful it closes down the main RivEX dialog. RivEX will fail to remove the Workspace if you have datasets loaded from the Output sub-folder. •RivEX will not delete the river network, but any associated output created by RivEX and stored in the Output sub-folder will be destroyed (e.g. node layers or sampling points). If you wish to keep these then these need to be copied out to a safe location. •If you have created your own folders and stored output in the RivEX_Workspace then these will be destroyed as well! •If RivEX fails to remove the RivEX_Workspace folder due to file/schema locking then you can close ArcMap down and delete the RivEX_Workspace folder manually via File Explorer, this is essentially what RivEX is attempting to do.